Japanese Ambassador Koji Tsuruoka has been advising Japanese industry to "keep calm and not rush to any conclusions"
The ascension of President-elect Donald Trump onto the world’s stage last Wednesday dominated the global news. At 4:05pm on the same day, less noticed, the Japanese Ambassador to the United Kingdom, Koji Tsuruoka, appeared before a parliamentary committee in room three of the Palace of Westminster. He spoke with understated intelligence and organised dignity – the Japanese way. He warned the EU External Affairs Sub-Committee of the dangers of “shocks”, not only for Japan but for businesses and people throughout the United Kingdom and Europe. Mr Tsuruoka represents a nation that has a lot at stake in the outcome of the Brexit negotiations. With more than 1,000 businesses employing over 140,000 workers directly, and with many more employed in supply chains, Japan is the second largest non-European country, after the United States, in terms of its investment in the UK. Hence its unprecedented Message to the United Kingdom and the European Union in September. The attraction of the UK for Japanese companies was made clear by Mr Tsuroka. Certainly, the ease of doing business in English is important, but for the most part and for numerous industries, he stressed that the current arrangements with the UK in the EU made for highly efficient business operations and it is this that has been put at risk by Brexit. For Japan, home of the Kaizan culture of continuous improvement, efficiency is paramount. This is especially true for the car industry, for which high efficiency and global competitiveness is a prerequisite for survival. It is for this reason that multinational integrated supply chains have been created. Cars are assembled from more than 20,000 components and each of those is sourced from suppliers across continental Europe. “There are many parts makers that supply the main factories here. Of course, Nissan is one. There are Toyota and Honda. It is not all made in the UK. They have to assign and order parts from where it is most efficient to do so,” Mr Tsuruoka said. Customs controls and tariffs add costs but also increase the procedural burden on the industry. If this is on parts received and also applies to finished goods the precious efficiency is further degraded. When it comes to pharmaceuticals, almost all Japanese companies have a European centre in the UK in order to be co-located with the European Medicines Agency (EMA) that regulates their access to the European market. This has also concentrated the essential specialist advice at the same location, so that companies can progress their regulatory filings in English with all the necessary competences to hand. Again, this essential efficiency is at risk as the EMA is likely to move out of its Canary Wharf location when the UK exits the EU. The harmonisation of regulatory standards is more important than any divergence between the EU and the UK, even when a change could make the UK an easier place to gain regulatory approval, Mr Tsuruoka stressed. As for the financial services industry, banks and service providers have gravitated to London from around the world, including Japan. It is this concentration of services that makes the City of London special for everyone, he said. If this is broken up by the need to move euro clearing operations to Frankfurt or Paris, it will be a nightmare scenario. The efficiency of their services would again be compromised. So what are Japanese companies doing to prepare for the eventual outcome? In reality, there is not enough information to prepare realistic scenarios and contingencies. In any case, the two-year period after the deposition of Article 50 should give time for business to adjust, but only when a transition period forms part of an eventual departure timetable. This is essential to avoid the “shocks” of a sudden change of trading relationship which would be unmanageable for business. This will be an important part of talks between the governments of Japan and the UK. Discussions between the UK government and Japan, including two conversations between Prime Minster Theresa May and her Japanese counterpart Shinzō Abe, have taken place, albeit in an ad-hoc rather than a formal manner. The Japanese embassy has let it be known that they remain willing and ready for talks on their future relationship when the appropriate UK ministries are up and running. As a country with considerable experience in negotiating trade agreements, unlike the UK, Mr Tsuruoka helpfully suggested this expertise could be made available to the UK. The EU, on the other hand, has not made any resources available to discuss Brexit-related issues with Japan and is taking a position that it would be inappropriate to hold such discussions until Article 50 has been triggered. However, the EU and Japan are in the late stages of negotiating an Economic Partnership (EPA), aiming to have the principles in place by the end of this year. This offers hope for a subsequent speedy bilateral agreement between the UK and Japan on condition that the UK retains EU negotiated terms and conditions upon leaving the EU. 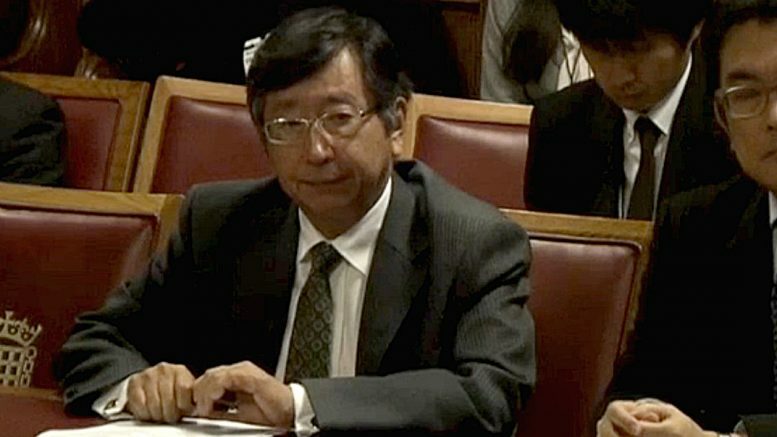 While most of Mr Tsuruoka’s evidence addressed questions on the commercial relationship between the UK and Japan, he also touched on the reasons for the recent Nissan decision to build two new models at their Sunderland plant, offering a personal insight into the cultural reasons that may have underpinned the decision. While Nissan is a commercial organisation and makes independent decisions on their industrial strategy to maintain profitability, Mr Tsuruoka also made reference to Nissan being a Japanese company. “First and foremost, Nissan is part of Sunderland. In Japanese culture, when you become part of a town or part of the community, you do not abruptly break up. You have created a tradition. It is more than 30 years. Nissan is like family in Sunderland. The Japanese way is to consider matters in detail and make a decision when they fully understand all the ramifications. “I have been advising the Japanese industry to keep calm and not rush to any conclusion—and it is more important to have careful scrutiny and consideration of all possible issues”, Mr Tsuruoka told the committee. Judgements will then be made on whether on not to stay, or come and invest further in the UK. It will depend on how the UK adapts to Brexit. David Brown: autodidact or freewheeler?